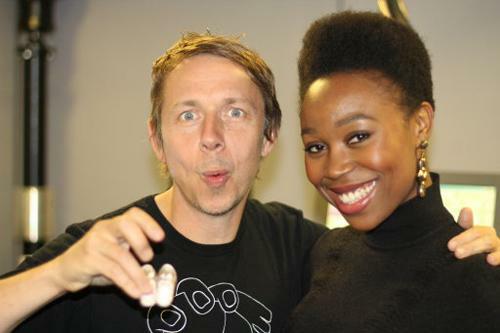 Dutch Neo-Soul/Jazz singer Ntjam Rosie was recently invited to fly over London to join Gilles Peterson on his radio program on BBC 1. Peterson is the widely acclaimed musical tastemaker of the BBC. The invitation doesn't come as a surprise. In October 2010 she released her highly acclaimed album “Elle”. And in 2011 she released the singles “Space’Of You” and “Morning Glow”. In July she will perform at the famous North Sea Jazz festival in Rotterdam. The video of ‘Space’Of You’ has Rotterdam all over it. The skyline, the bridge, the space and Ntjam Rosie. And as always she stays close to her Cameroonian roots. Ntjam Rosie received her Bachelor of Music from the Codarts Conservatory and she won the Music Matters Award gaining her the title of music ambassador of Rotterdam in 2010. Which really is an honour, because Rotterdam is the "silicon vally" of black music in The Netherlands. A lot of creative Neo-Soul, R&B and Jazz singers are from the harbour city. Rotterdam is a fusion culture city. It's a vibrant mix of cultures from the Cabo Verde, Suriname, Dutch Caribbean and many other cultures. As a an Amsterdam native I have to admit that my city has lost the black music vibe long time ago to Rotterdam.